Happy New Year! 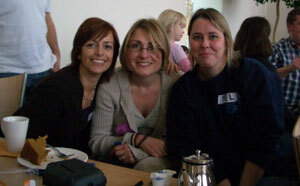 We”ve been letting the suspense build up so long that we are positively bursting to tell you all the news. Firstly, did anyone see the Christmas Lectures? Food was the main topic this year.In the same room where Faraday first demonstrated electricity, Professor Krebs introduced a pink eglu and chickens as a demonstration of evolution and selective breeding. For all the train spotters -James was the Chief Chicken Handler and you could just make him out in the audience. 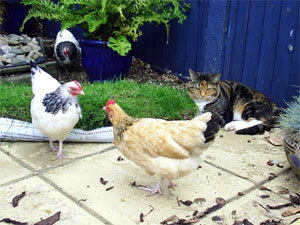 We are hoping to add awebcam service in the coming weeks – so you can broadcast your chickens live on the internet. You may have bought or received a Christmas card with a difference this year. Omlet’s first ever festive card collection was not only suitably chickentastic but we also pledged to donate some of the proceeds to the Battery Hen Welfare Trust (www.thehenhouse.co.uk) a cause close to our hearts. By buying the cards you raised a fantastic £191 and we’ll keep you updated as to how the money has been spent. 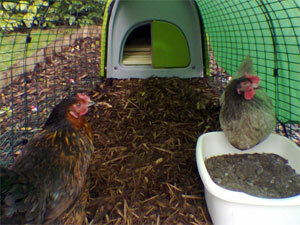 We have also produced some improved feeders and drinkers – called Grub and Glug. These hold more water and feed and are generally easier to use. You can find out more about them at the bottom of the Newsletter. Elsewhere, Barbara finds time to let her eye wander over the new breeds section on the website but will some of the more extraordinary looking chickens on offer be enough to tempt her away from her beloved Gingernut Ranger? Find out in this weeks thrillinginstallment of Barbara’s Diary… Enjoy the newsletter and looking forward to an eggcellent year. Left to Right- lots of people. Sorry if we haven’t mentioned you. The Venue for the get together was the suitably grand Orangery at Kew Gardens. William and Hanns from Omlet meet the eglu owners and reveal some excitingnew projects. I was looking through the new Omlet breed directory the other day and have to admit to having fallen for some of the rather showy members of the chicken family. There’s something pretty wonderful about the extraordinary frilly Vivienne Westwood look sported by the Frizzle whose feathers stick out all over the place in true punk rocker style. The amazingly feathery knickerbockers and beautifully rounded appearance of the Cochins makes them look just like walking duvets while the spectacular headgear sported by the Appenzeller Spitzhaubens, Polands and Houdans would not look out of place on Ladies Day at Ascot. There is such variety in the poultry world. Sebrights, for instance, have the most beautifully laced plumage where each feather is edged with black which is so striking and the Sussex with their smart black and white outfits come straight out of My Fair Lady. You can’t fail to be impressed by the abundantly feathered Orpingtons and the sweetly comical Silkies with their pom-pom hats bring a smile every time. The stately, statuesque Brahmas are wonderful to behold and stand nearly knee high. They have the most delightfully feathery feet and heavy eyebrows and yet will happily stay behind low fences as they can’t fly! 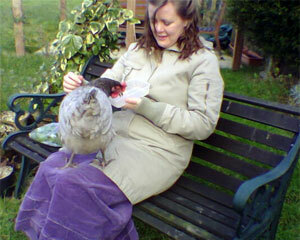 Despite all these fantastic and beautiful hens, my heart still lies with the hybrids though. I have a real soft spot for the Gingernut Ranger with her beady eye and friendly nature. The ginger feathers glow in shades of gold, brown and red in the sunshine making her anything but a plain little brown hen. 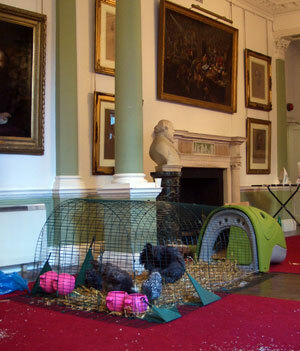 Red carpet treatement for the chickens that starred in this years Christmas Lectures at the Royal Institute – Mayfair, London. Did anyone else see Betty and Elsie performingat Holiday on Ice over Christmas? Do your chickens have a party trick? Gwendolin has been attacked by a hawk or something similar she was defending herself with the most bloodcurling scream I ever heard. It would work well for Halloween. Aquarius21January –19 February If people tend to eggspect a lot of you maybe it is because you are so eager to please. But be careful about setting a standard that you will find difficult to live up to. With the way the galaxies line up this month you need make time for yourself so that you don’t peak to soon as with a soufflé – timing is everything.